Travel across the 7 oceans in search for the great fortunes and the sunken loot that can be found at the bottom of these oceans. You can do all of that through this classical 3 reeled slot that invites players to take a trip to the deep oceans where they can claim their own share of the sunken treasures. 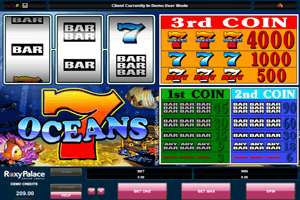 Just like classic slot, it has a simple format of three reels with one payline. These reels can be found on the left side and under the reels, players will see the logo of the game which is found in the deep ocean with golden treasures surrounding it. Play 7 Oceans Slot here. The icons that will spin include bar symbols and 7s symbols. There are two 7’s symbol, red sevens and the blue sevens. The Red sevens represent the highest paying icons of the game. This is why players who succeed in getting three red sevens on the payline of the game after placing the biggest bet of 3 coins will get to activate the jackpot win. This jackpot reward is equal 4000 coins.